Easter - A Week Late! A few justjohanna Easter inspired creations that I'm just now getting around to posting. The first is a bonnet that Johanna challenged us to create. I found the template for the hat on Linda Duke's blog, who creates the most beautiful hat cards. This image of the chicken legs sticking out from the shell continues to crack me up! The background for this egg was created using the "polished stone" technique, which involves reinkers, glossy paper, a cotton ball, and rubbing alcohol...intriguing, no? The last one involved creating a scored background using my scoring blade. With this process you need to sponge some color over the score lines to make them more visible. I also love, love, love this bird image! Hope everyone had a blessed Easter...nothing like running just a tab bit behind schedule! "For I know the plans I have for you, declares the LORD, plans to prosper you and not to harm you, plans to give you hope and a future. Then you will call upon me and come and pray to me, and I will listen to you. You will seek me and find me when you seek me with all your heart." Ester makes a wonderful point that if only we truly believed in God's promises- we would worry so much less. It is such a reassurance to know that we have a great God who is in control of all things. I didn't use this verse from Jeremiah on my card, although it is an excellent text! The first verse that came to mind when I heard the challenge was John 3:16, which is so well known, "For God so loved the world that He gave His only begotten Son that whosoever believes in Him should not perish but have eternal life." Praise God for His love towards His people! Please visit the SALT blog to see the rest of the team's beautiful creations and if you're feeling inspired to create a piece based on this week's challenge, why not leave us a comment with a link back to your blog or gallery...we'd love to share with you! Two Great Finds - One Great Friend! It seems the more responsibilities one has (spouse, children, work, etc. ), the less opportunity one has to get out and do something fun. Well this week not only did I have an opportunity to get out and do something fun but I had an opportunity to get out with my dear friend Julie! And we were all alone...minus all little ones or spouses! We had a lovely time shopping, dining, and talking about stamping! And has anyone out there ever had a homemade popover? I just had my first one ever...in 41 years...and oh my was it ever good! I don't think I should have had it because now...well...I want another! LOL! Wanted to share two of my shopping finds...The first, the most fabulous pair of boots found in a second hand store. I snagged these Steve Madden boots for $22! They were brand new...I'm in love. :-) And this very fun coffee mug found in an art gallery. Now if you're like me, you have more coffee mugs than you know what to do with but I just loved this simple clean design and I couldn't live without it....OK, I could have lived without it but...I needed it, didn't I? (Right...) This is a small mug, fits perfectly into one's hand. Wonderful for my late afternoon cup of 'pick me up' coffee! Yes, I know it's a month past Valentine's Day but honestly that's about how back logged I am on my stamping work! :-) I've been working with the justjohanna design team, which is great fun, but it's been so busy that I've had little time to stamp or post, so my apologizes for having perhaps the most boring blog around! LOL! Today's card was created using justjohanna's giant mug (she also has a handy, dandy tea cup), dotty border, and love is brewing stamps. One of the things I love about this mug image is how versatile it is; for my card I paper pieced the design inside the mug image but you could also simply color the image (it's an outline of the mug), stamp inside the mug image with other fun images...the possibilities are endless! At SALT this week it was Casey's turn to set the challenge and she chose the message of being His princess. You can read the entire challenge text here. I admit that my piece isn't focused specifically on the challenge topic but I liked the "children of the King" thought, which Casey mentions in her description and decided to focus on that idea. I ended up at this portion of scripture from Isaiah after a friend mentioned a hymn whose focus was on this very topic of children of the King. One of the song's stanzas reads, "shout, ye little flock and blest; you on Jesus' throne shall rest, there your seat is now prepared, there your kingdom and reward!" What a blessed promise! The song referenced Isaiah 35:10 and I used just a small portion of that verse on my card, here it is in it's entirety, "And the ransomed of the Lord shall return, and come to Zion with singing, with everlasting joy on their heads, they shall obtain joy and gladness, and sorrow and sighing shall flee away." 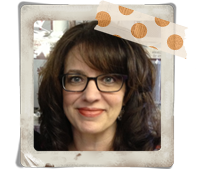 Paper and background stamps by Stampin' Up! All images justjohanna (don't you just love the owl and the little chick legs sticking out from the broken shell...how funny is that?!) Paper on the owl card is K&Company, chick card is SU! 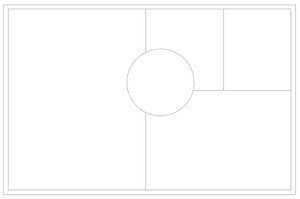 Die cut circles thanks to my all time fav Nestibilities. The sketch is below...why not give it a try! If you create a card based on this month's sketch, leave me a comment with a link back to your blog or gallery, would love to see what you come up with! 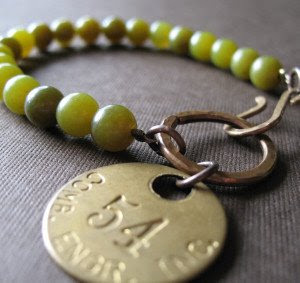 I just have to gush over my friend Gillian's jewelry...I think I've mentioned before that I met Gillian through my blog and she's become a dear friend. And I am so excited about her jewelry and I just have to share!! She makes the most amazing, unique, one-of-a-kind vintage pieces and I finally got a few goodies for myself! 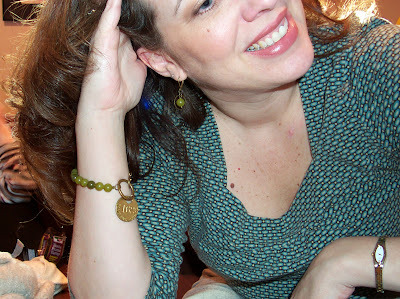 Here I am "modeling" the darling bracelet shown above as well as the matching earrings. Please go check out her Etsy store here!! Thank you my dear friend, I adore the jewelry and truly appreciate the work and love that went into the pieces!! I think I've said this before but I'm gonna say it again...I LOVE justjohanna's sentiments! There's the "you rock" and "you're 29 again?" and this one, "merci birdcoop!" How fun is that?? A perfect pairing with three little birdhouses all perched on their own individual tags and held together with a bit of ribbon. 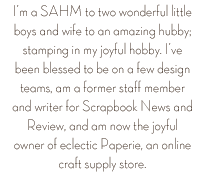 Other details: The paper is a recent release from Stampin' Up! and includes some of the most delightful, Spring prints. The houses have been paper pieced and the roofs are corkboard pieced! Johanna has just released the most adorable, irresistible images!!! This has to be one of my favorite releases yet...think itty, bitty spotted cows, hay bales, barns, stoves, owls...It's truly fabulous! Check out all of the new goodies here! !